Is the discovery of crude oil a blessing or curse for emerging economies? Does it further or hinder democracy and development? Is an oil rich nation’s currency destined to suffer from Dutch Disease? These are profound questions and nowhere do they need to be answered more than in the continent of Africa. John Heilbrunn’s book Oil, Democracy and Development in Africa published by Cambridge University Press tackles the socioeconomic and political impact of oil in sub-Saharan Africa head on. In a somewhat refreshing take, Heilbrunn suggests that should historical and economic situations faced by African petrostates prior to the discovery of their oil be contextualised and discounted, there’s little evidence of a curse. Taking on a more optimistic tone than most, the author sets about a fascinating explanation of why he thinks even the most despotic and least accountable of African heads of state do use some proportion of oil revenues to improve their citizens' living standards. While sum of all its parts makes this book a great read, Heilbrunn’s take on resource revenues, corruption and contracts in latter stages of the narrative should strike a chord with most readers. It has to be acknowledged that some African producers are pretty high on the corruption scale, but not every producer can be tarred with the same brush. These choices alone determine the pace and scale of progress anywhere and not just Africa. Some of the book’s conclusions might surprise many readers, some might find the narrative a bit too optimistic for their linking, but for the Oilholic it’s a book containing some unassailable truths on African progress. Heilbrunn is not attempting to gloss over what’s wrong at African petrostates. On the contrary, he puts forward what they are doing to get it right, with all their imperfections, following on from decolonisation and the inevitable expectations (plus subsequent windfall) a resource discovery brings with it. The Oilholic would be happy to recommend it to fellow analysts, those interested in the oil and gas business, African development, politics and the resource curse hypothesis. Last but not the least, that growing chorus of commentators calling upon the wider world to ditch archaic conclusions and reassess the impact of natural resources on developing economies would also enjoy many of Heilbrunn’s conclusions. © Gaurav Sharma 2014. 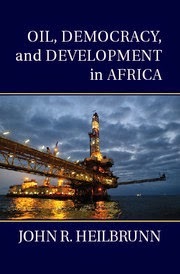 Photo: Front Cover – Oil, Democracy and Development in Africa © Cambridge University Press, June, 2014.